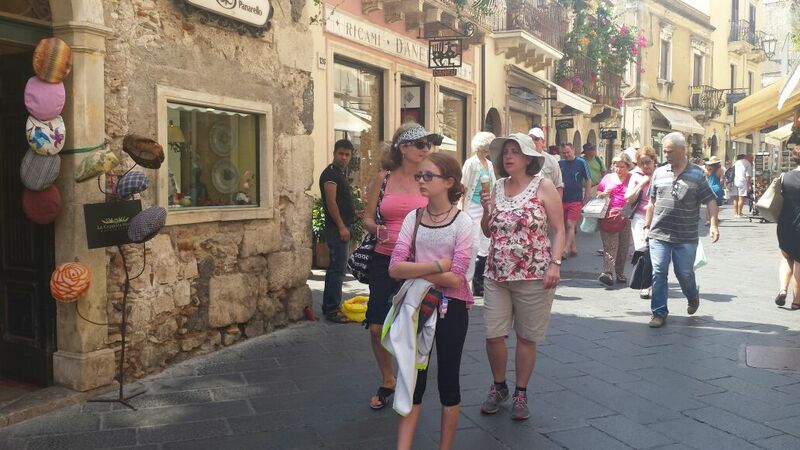 Corso Umberto, the most important street of Taormina, named after Umberto I of Savoia, king if Italy starting 1878 untill 1900, was an integral part of the old street called Valeria that in the past connected Messina with Catania. In roman age Valeria street crossed the city to fall back towards the sea, down to the valley of the river Sirina. Along the time, Valeria street was testimonial of so many changes. The magior part of the monuments of greek-roman age left place to new constructions as: the temple of Giove Serapide that left the place to the church of S.Pancrazio and on the ruins of Odeon rised the church of S.Caterina. Also there rised palaces, churches and around this important street is formed the actual storical centre. 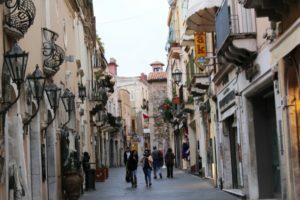 The Corso Umberto I, delimitated to the north by the door Messina and to the south by the door Catania, offers testimonials of syles of different ages, starting with the arab style then norman, gothic and baroque style. Today, Corso Umberto I is a wonderful pedestrian rich of shops and tipical restaurants and every day milions of visitors from all over the world cross it. Do you want to know CORSO UMBERTO?